In the future, transportation and accommodations will come in one luxurious but convenient package. When you go out of town, you usually need to buy a few nights at a hotel in addition to a plane, train, or bus ticket. Brandan Siebrecht, a graduate architecture student at the University of Nevada, Las Vegas, wants to combine these components into one experience. 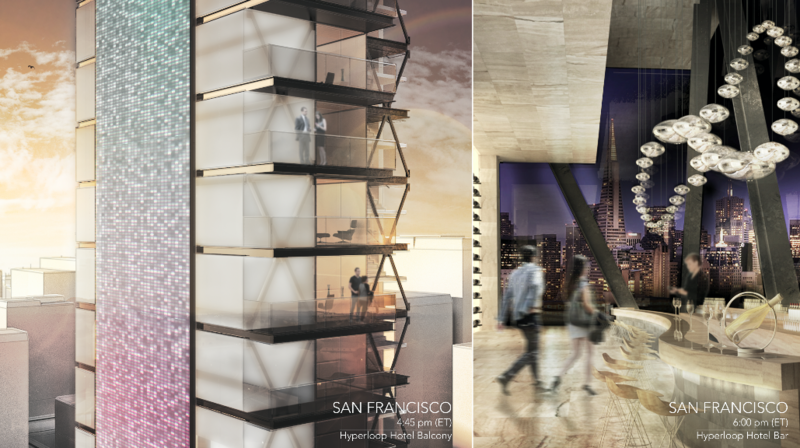 He designed what he calls the “Hyperloop Hotel,” a system that would feature a transit system and 13 hotels in different cities throughout the United States. Siebrecht is the student winner of this year’s Radical Innovation Award , a competition for imaginative hotel designs. In June, a jury of seven hotel investors, developers, and architects selected Driftscape as the one of two finalists out of over 65 submissions from 24 countries. The design was inspired by DevLoop, a real test track for Hyperloop Onebeing developed north of Las Vegas. A concept first introduced by Tesla CEO Elon Musk in 2013, a hyperloop is a mode of transportation that would propel a pod-like vehicle through a reduced-pressure tube. Hyperloop One wants the system to be energy-efficient, autonomous, and quicker than a plane. Though the project is still conceptual and has experienced delays, the startup has said its goal is to deliver a fully operational system by 2020. 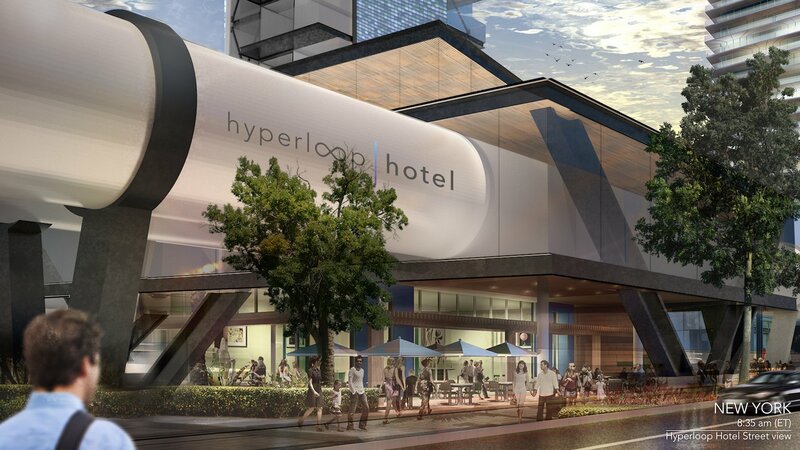 For a flat fee of $1,200, Hyperloop Hotel guests would be able to zoom quickly between the network of cities, all while never leaving their room, Siebrecht tells Business Insider. He hasn’t estimated what each night would cost yet. “Guests would be able to travel to any hotel destination within the network and even visit multiple destinations in a single day,” Siebrecht said. The size of the modular hotels, which Siebrecht estimates would cost around $10 million each to build, would depend on the location. Hotels in dense cities would likely have smaller footprints than ones in less dense areas. Guest suites would be made of re-purposed shipping containers that Siebrecht says would be “outfitted for luxury.” Each would include an office, a living room with a flatscreen TV, a bedroom, and a bathroom. 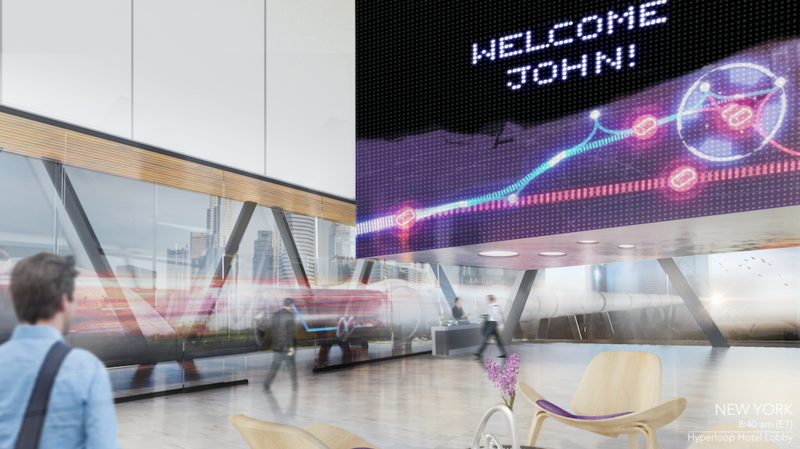 There are no concrete plans to build the first Hyperloop Hotel, since the technology and infrastructure it would require doesn’t actually exist. Siebrecht believes construction of his hotel concept could be feasible within the next five to 10 years. “I believe the Hyperloop One is the next big innovation in transportation in the United States and possibly the world,” he said. “I wanted to explore ways in which this technology could transform the overall travel experience and hospitality.